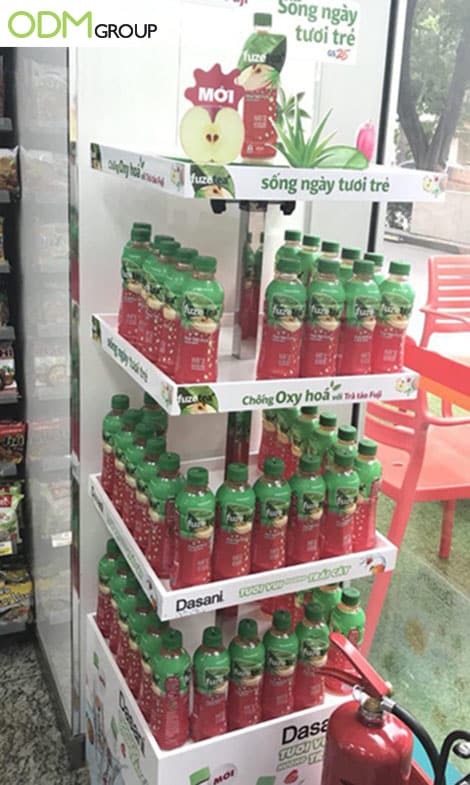 Fuze Tea Vietnam has come up with their own promotional display rack to showcase their latest product line: apple flavored tea drink! This simple cardboard POS display is certainly captivating! A simple design like this is easy to attract the attention of consumers, which is similar to custom in-store display by P&G. No doubt that Fuze Tea is bound to gain more customers with its unique POS display idea. The bottom of the POS display design promotes the wide range of product line it has while the top exhibit its new promotional drink. It sure is an effective way to get customers knowing more about their brand! Why Do We Love This Promotional Display Rack? Increase of Brand Awareness – The display rack was placed strategically near the cashier where consumers will definitely pass by. Therefore, with forward planning and user-friendly design, brand recognition will surely soar beyond other brands. Cost-Effective – The material used is mainly cardboard which is cheap to procure. By minimizing production costs, it maximizes the profits and competitive edge of the brand. This is surely a smart marketing strategy that is suitable for small brands wanting a breakthrough in the industry! Visually Appealing – Although the brand uses cheap materials to produce their custom display stand, the use of color white creates a modern and minimalistic overall look for the brand. It brings about classiness and makes texts and images easier on the eyes. Hence, Fuze Tea will certainly gain more profits and customers interest in the brand. Hence, other than on-pack promotions and complimentary gift with purchase, many brands should also consider POS display in their next promotional campaign. At ODM, we have aided many brands in producing customizable and unique brand packaging design that proves to be noteworthy of praise. Feel free to contact us for our expertise and our team will be sure to help!